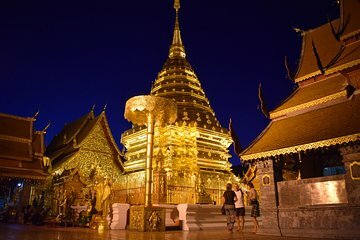 Visite três templos budistas ao redor de Chiang Mai, incluindo o Wat Doi Suthep - um dos templos mais importantes do norte da Tailândia - nesta excursão particular de meio dia. Seu guia mostra os menos conhecidos Wat Umong e Palad Temple (Wat Pha Lat), depois continua até Wat Doi Suthep, onde você pode ouvir monges cantando e assistir o pôr do sol sobre Chiang Mai. Você também tem a opção de praticar meditação em Wat Umong. Pick up and drop off were on time. The driver managed the conditions up the mountain well. He had a good sense of humour. The tour guide was very knowledgeable and spoke English well. The first two sites were very interesting, not so touristy or busy even on the weekend. The tunnels were a bit too busy for meditation so we meditated at another place which was extremely quiet and peaceful, allowing us to take in the sounds of nature. I previously visited Doi Suthep earlier in the same day so I wasnt expecting much but I got to see a lot more compared to the morning. We saw monks chanting at around 6pm and the view from the viewpoint was much better.